Jiri Fischer, center, celebrates his goal during Game 1 of the Alumni Showdown against the Toronto Maple Leafs on Tuesday. DETROIT — He might have looked a little out of place on the ice with some guys who were twice his age, but Jiri Fischer was just happy to be playing. Everyone remembers the night Fischer went into cardiac arrest on the bench during a November game in 2005 against the Nashville Predators. Although Fischer made a full recovery, he was never medically cleared to play in the NHL again. So on Tuesday, in Game 1 of the Alumni Showdown at Comerica Park against the Toronto Maple Leafs, Fischer actually scored the game’s first goal. "It felt great," Fischer said. "As the game evolved, that was maybe the last goal in a Red Wings uniform for most of us to score." Fischer remains with the Red Wings as director of player development. "I feel young for alumni games," Fischer said. "We joked about it for a year and a half with (team doctor) Tony Colucci, who saved my life eight years ago, if I was going to be able to participate or not. He was nervous behind the glass, but everything worked out." Fischer said it was fun to play with Aaron Ward again. "I was partnered up with Aaron Ward, who was the first one when I got on the Wings when I was 19," Fischer said. "I didnât have anywhere to live and he invited me over to his house to live for two months, until I found a place to live. I have really been taken care of by the organization." Michigan coach Red Berenson is 74 — 41 years older than Fischer — yet the two were teammates Tuesday. "I asked Jiri when heâs going to make a comeback, so itâs about time," Berenson said. "Iâve skated a couple times with him in practice, and heâs enjoyed it. "Good for him. I thought he might be in the other game, but they delegated him to our game." 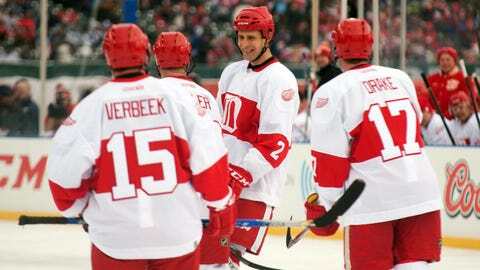 Fischer didn’t seem to mind being in the first game, as opposed to the one with some of his former teammates, such as Steve Yzerman and Nick Lidstrom. "It was a little fairy tale," Fischer said. "Snow started to fall down, and Toronto kept coming." "For the last shift, Red Berenson, being the greatest coach in college hockey he is, he had a game plan. He huddled us all together. He basically told us what to do. "Unfortunately, we didnât execute how he mastered the plan, but we kept the puck out of the net." And the Wings got the win, which might not count in the standings, but is important for alumni bragging rights.